Black Prism Moon is a participatory performance and workshop cycle in 3 phases. Black Prism Moon in performance is a vast and endless world of two queer Black Femmes, playing, praying,loving,transforming. Open to all. In phase two and three we invite Femmes of color to take a personal leap into the cyclical and spiritual dimension of the Black Prism Moon performance, through embodied dialogue and an experimental vocal sounding workshop. *The second and third phases are for the spectrum of trans, qpoc, womxn, cis women and non-conforming femmes of color. Saturday June 2nd and Sunday June 3rd 2018, @ Links Hall 3111 N. Western Ave, 7:00pm, $10-$12 online. $15 at the door Find tickets here! Black Prism Moon is a new work from multi-disciplinary artist and healer Sojourner Zenobia. 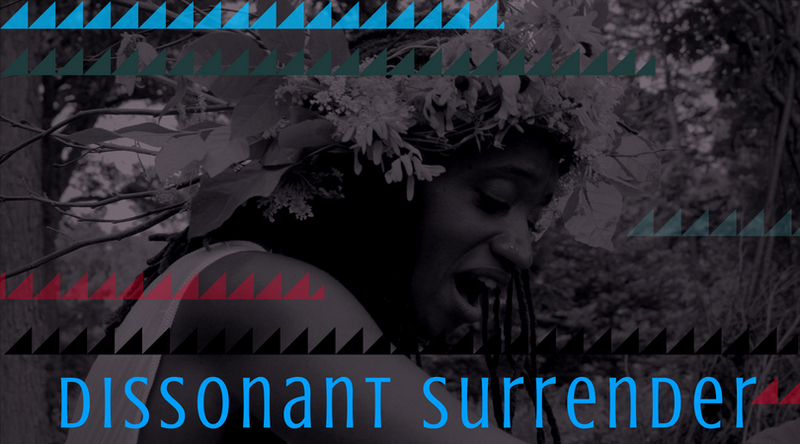 Two queer black women from the beyond offer a participatory dreamscape, a tapestry of medicinal embodiments and offerings, their world unfolding through vocal sounding, movement, text and installation. Making use of several spaces within Links Hall, the two femmes navigate the entryway, bar area and theater space of Links Hall, filling it with unearthly movements, sounds that awaken and channel playful interactive scenes of childhood, and personal soliloquies on aging and reconnecting with the earth. We are present and we participate, but are left with a feeling that this is a world of exploration and healing that never ends. phase II: BEE BODY; An embodied dialogue inspired by the sweetness of collective consciousness. *This workshop is for the spectrum of trans, qpoc, womxn, cis women and non-conforming femmes of color. ***Bring your program from the BLACK PRISM MOON performance and receive a special gift!!! In phase one of Black Prism Moon, the performance, the spirit of the Bee emerges over and over. In this embodied dialogue we will feel into the ancient wisdom of the bee through collective sculpture and dance making (no movement background needed). We will meditate to bee music, and taste honey to delight in sweetness and healing. Beauty, work ethic, sacred geometry, community and Oshun, the Yoruba deity of love and creativity; these are only a few of the gifts that unfold when working with bee energy. Join us to experience what bee medicine reveals to you. Bee Body is co-created experience by Sojourner Zenobia of Stillness: Meditations and Ritual for Femmes of Color and Amina Ross and Jory Drew of Beauty Breaks uniting artists, beauty and wellness practitioners to re-imagine, re-define and re-vision what Black "Beauty" and Black "Wellness" mean today. Sunday June 10th 2018, @ Reunion Chicago 2557 W. North Ave, 2-5pm, $20 Suggested Donation at the Door. The two queer Black femmes in Black Prism Moon explored a vast spectrum of sound with their voices. As they surrendered to the guidance of the body and intuition their voices became subtle and primal, along with beautiful and melodic. Zahra and Sojourner from Black Prism Moon will guide you to experience the vast layerings of your own vocal landscape. Leave your comfort zone at the door! No hierarchy of sound here. As our voices resonate dissonant sounds we connect with ancestors and nature. We discover new spaces in our bodies, and share personal mythologies purely through sound.